« ABC Kids Expo – CuteyBaby exhibits! 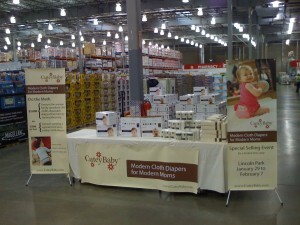 We are delighted to be doing more Costco events in Chicago, IL and Madison, WI areas this Summer! Would love to see you there – we will be on hand to chat with you about cloth diapering, answer any questions, and show you how CuteyBaby Modern Cloth Diapers work. You must be a Costco Wholesale member to access the in-store event and buy at our very special Costco pricing. 4 comments to More Costco events in Chicago area! you really need to come to a Houston tx Costco!! my husband works for costco and I know he would go nuts to see cloth diapers at his store!!! and probably buy one of every one you have!! Im looking in to buying a cutey baby to try out since Im finding design flaws in all my other diapers…we just started CDing a few months ago on my 1yr old and we are loving it but still looking for that diaper we just love!